I was readying myself for a Christmas-less non-winter. I had been in southern India for nearly two and a half months for an assignment. A few days after I had arrived from the south to my grandmother's home in Mumbai, I saw it for the first time. Nestled in my grandmother's housing complex (usually called "the colony"), smack-dab in the center of town, was a tree. It wasn't the typical banyan or coconut tree that one would expect in the warm climate. It was a Douglas Fir. It had been unusually hot and muggy this December, but the tree was ready for Christmas, dressed in tinsel, ornaments, more than 7,000 dancing lights, and a giant star. I asked my grandmother about it. "It's Saldanha's tree," she said. She told me that Henry Saldanha had been a close friend of my late grandfather, whose memory cast long shadows here. When I was introduced here as Raghunath's granddaughter, I would be received with stories from the neighbors, smiles and chatter from the washermen, pleasant nods from the storekeepers, cups of tea, free passes through the colony gate, pats on the head. I found out now that his dear friend was unwell. That his daughter had died of cancer. The tree looked like it belonged in a snowy forest, not a hot island city. And it was decorated to the nines. I was curious. A few days later, I found myself sitting in the Saldanhas' living room, cluttered with family photographs, plastic flower displays, China cabinets, and at least two pictures of Jesus, framed in Christmas lights. The two chocolate Santas that my grandmother had thrust into my hands (because Indians never arrive at a house empty-handed and never leave it empty-bellied) lay between us. Christmas had practically exploded here. Henry Saldanha, ravaged by cancer and heart trouble, sat shriveled in his chair. He smiled and shook my hand warmly when I told him I was Raghunath's granddaughter. His wife Grace, with her wide-set eyes and crisp British diction, spun me the tale. "Everybody comes here, the whole of Bombay comes to see," she said. "It was about seven feet high when we bought it. Now it is over 50 I think!" The tree had humble beginnings. Grace and Henry Saldanha purchased it from a neighbor more than forty years ago and planted it in their garden. Their children, Twila and Douglas, would decorate the tree every year. The family would throw Christmas parties for the children of the neighborhood. In 2003, Twila, who had taken up residence in Houston, was diagnosed with a terminal case of cervical cancer. "[Henry] prayed, saying, give me the cancer. My daughter is young. Give it to me." His prayers were heard. Henry was diagnosed with bladder cancer. Against all hope, his daughter went into remission for a year. But cruelly, as her father's condition deteriorated in India, Twila relapsed. Grace left for Houston to tend to her daughter while Douglas stayed behind in Mumbai to care for his father. Within a few months, Twila was about to die. She asked that her father and brother fly to Houston so they could spend her last moments together. Though her father was suffering, he and Douglas made the journey to be with her. Friends brought food, gifts, and love. As the word spread about the family's plight, strangers started coming to their doorstep, praying for the family and offering their help. "We had nothing to eat! The news spreads and many people, neighbors, started coming and praying and they started feeding us," said Grace. "The miracles just kept following us, as if God was looking after us." Twila died five months later. She left a parting wish. "She told Doug, 'You have that Christmas tree. You decorate it so I can see the lights from heaven.'" The family did just that. They began holding their famed Christmas party again. They hired a Santa to distribute gifts. And they topped themselves with the tree each year. It throbbed with life. Twila was still alive in her family's loud declaration that her memory was worth keeping and sharing. That her wishes were worth honoring. That her life had been important. Douglas could be found every evening, puttering around the garden and supervising the men who came with ladders to add an ornament here and make an adjustment there. The Saldanhas included people in their story. By sharing the tree, they were sharing Twila's memory. As long as the tree lived, no one could forget her. 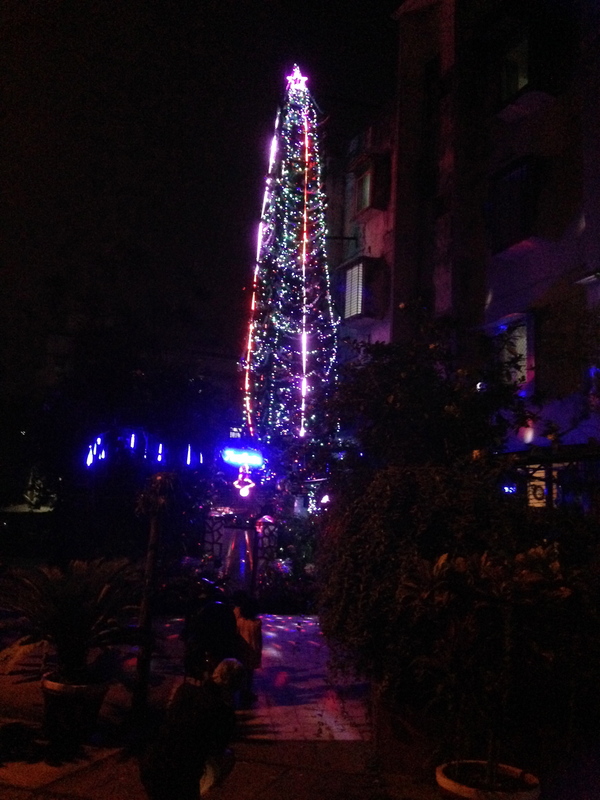 The colony got the gift of a loud, lovingly professed Christmas in Mumbai. "Douglas spends a lot on the tree. He says, 'This is Twila,' "
I got a gift too. I had burst my first Diwali firecrackers this year. But I was raised an American Hindu who feels more nostalgia for December pine in New York than October sulfur in Mumbai. I didn't think I would see a Christmas tree this year. And this one was startlingly alive, outside, swaying between private mourning and public celebration. A tree grows here, across the world, in memory of a woman I will never meet, the daughter of a man who has shared many toasts with the grandfather I have hardly known. It takes the breaths they hadn't taken. 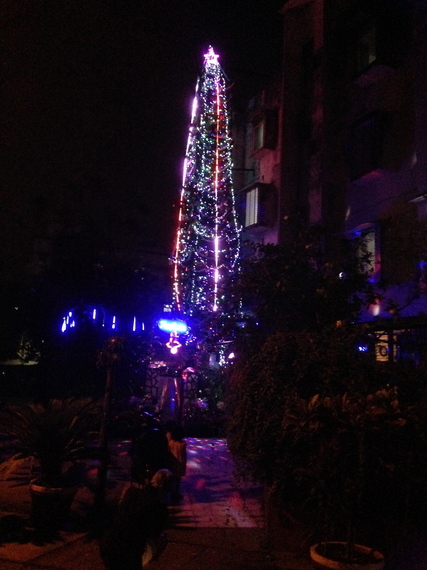 It is dressed in the finest lights.